Hey, ho – time once more for one of my semi-regular rants about the horrendous use that some people put the English Language to (no doubt including myself, on many occasions). Today it is “Literally” as heard all too often on the radio or seen far too frequently on the old interweb. “I was literally glued to the toilet” – who did this fiendish thing to you? “I was literally scared to death” – where do I send the flowers and how are you communicating from beyond the grave? “I literally jumped out of my skin” – Please inform Medical Science, right now, this is truly amazing. Unless somebody applied superglue to the toilet seat before you dashed there with your urgent call of nature, you literally spent a lot of time there. Figuratively speaking, you might say that you were glued there. Literally, you were extremely scared. You may even have feared an early demise but only figuratively-speaking were you scared to death. It was not actual – you remain here, telling me all about it. Literally, you were startled. If your bones and flesh and many organs actually leapt clean out of your skin, well words simply defy me. You are a miracle indeed. Now – do you want to get me started on “deceptively.” This one has been annoying me for a while. Even this very day I saw a good and well-educated friend misuse the word. Normally it is our Transatlantic friends who have this tendency; it was disappointing to see an English University Graduate do so. Should I simply be deceptively calm on this matter, declare it to be a non-issue and just move on. Or maybe I can simply note that the august Guardian SG says that use of “deceptively” is best avoided, while deploring the fact that Estate Agents will no doubt continue to deploy it. I use “while” not to annoy my friend Gill but because the same Style Guide states assertively; while not whilst. OK. I shall leave it alone for now. You can look forward to the next time, when no doubt I shall be ranting about verbing the noun. I leave split infinitives to hardier souls than I.
saw some solid graft. I sorted out the dishwasher after breakfast and then set my bread to rise and skeined off the plying that I had done last night. I plied the remainder of the singles while I was keeping half an eye (figure of speech, not a literal feat) on my mushy peas simmering away on the Aga. 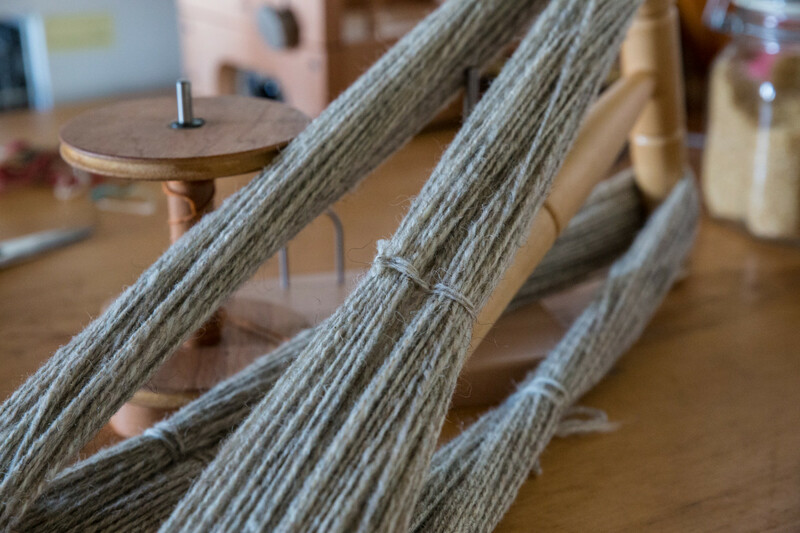 I left the plied yarn to set and will skein it tonight. I feel as though I am making headway. Replenishment of my mustard supplies, plus the three plug adapters that I needed in order to use the new studio lighting kit. Mr L’s deliveries were more prosaic and contained among (GSG: “among not amongst”) others, a scheduled delivery of toothbrushes and 96 packets of cat food! Amazon, how we do love thee. I have email to say that my photo prints are on their way home to me. I see news today that the East Mainland Show is cancelled due to wet ground and expected weather. I hope very much that the same fate does not befall the Sanday Show at the end of this month. Herbin have announced a new ink, forthcoming in two months’ time. It looks amazing. Bureau Direct have a draw to win a sample. 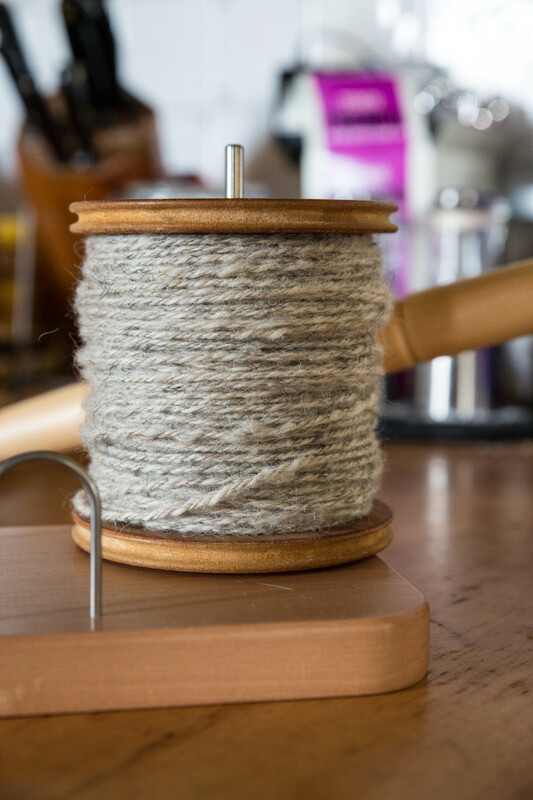 Later on today we will move an extra table into the front room and I will try out the studio kit – very possibly in taking product shots of mustard jars… Firstly however, I will need to refill a bobbin of singles in order to keep on schedule with the spinning.